UPPER WEST SIDE — Upper West Side, can you hear me now? Uptown subway riders will be the most connected straphangers in the city by the end of 2012, according to the MTA, which has put the area first on its seven-phase wireless Internet and phone service project. Transit Wireless invested "roughly $200 million" in a capital project to design, build, operate and maintain the system's underground wireless network, according to CEO Bill Bayne. Transit Wireless is in the midst of negotiating contracts with phone and data carriers. T Mobile, AT&T and Boingo WiFi have already made commitment, and advanced negotiations are open with Sprint, Verizon and MetroPCS. Transit Wireless will split revenue with the MTA, expected to be close to $40 million over 10 years. The MTA has already rolled out a pilot program that put wi-fi and cellphone service inside the L train stops at 14th Street and Sixth and Eighth Avenues, the 14th St. A/C/E and 1/2/3 stops, and the C/E station at 23rd and Eighth Avenue were the very first to receive wi-fi and cell phone services. In the next phase, which Transit Wireless expects to finish by early December, with some stations coming online as early as October, the company will outfit the 1/2/3 lines between 59th Street and 96th Street and the B/C lines between 59th and 96th with wireless access. 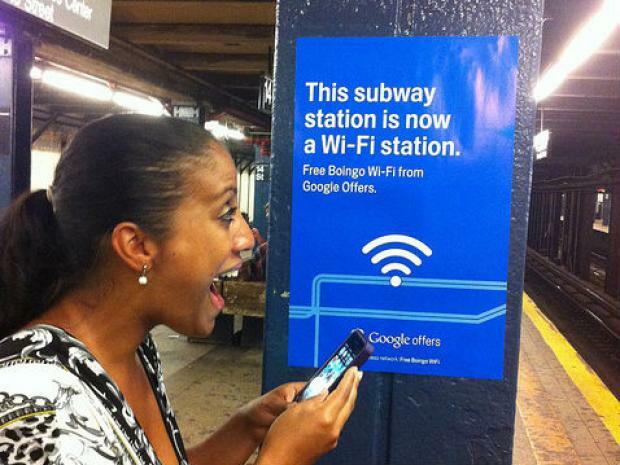 Rockefeller Center and Times Square stations will also be part of the 30 stations in phase 1. All 277 underground MTA subway stations are slated to be online by 2018, though Transit Wireless hopes they can be ready by 2016. Riders will have cell phone and wireless services throughout the station and while riding the train through the station. Bayne said the change will improve connectivity as well as safety underground. "NYPD advises that if you see something, say something. Right now, if you see something below ground there’s no way to say something." It's also welcome news for those who spend their time underground catching up on their smartphone. "If you’re running behind schedule you can call your office, call your home," he said. Parents will also welcome the opportunity to reach kids who are riding the subway alone, Bayne said. "The New York subway serves almost 2 billion riders per year and to not have connectivity to the outside world is incredible," Bayne said.